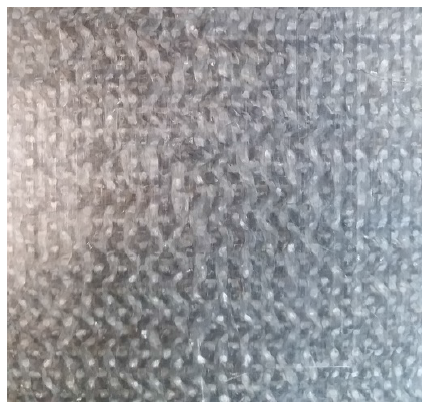 The reinforcement fibers must be conductive (i.e. carbon fiber) to directly heat the composite. Directly heating the polymer due to displacement of current between fibers of insufficient contact is assumed to be negligible and not considered. Dielectric effects are benign below the MHz range. 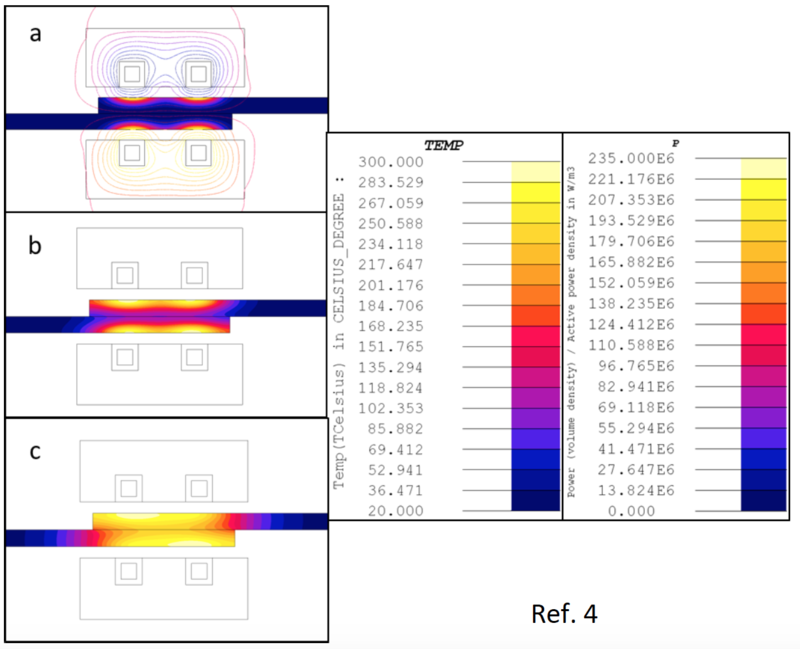 Electrical resistivity is a key material property for predicting thermal performance with induction. CFRT has relatively high resistivity (compared to metal), which leads to generally less of skin effect and a higher reference depth. This means a higher frequency may be desired when compared to metal for the same geometry. 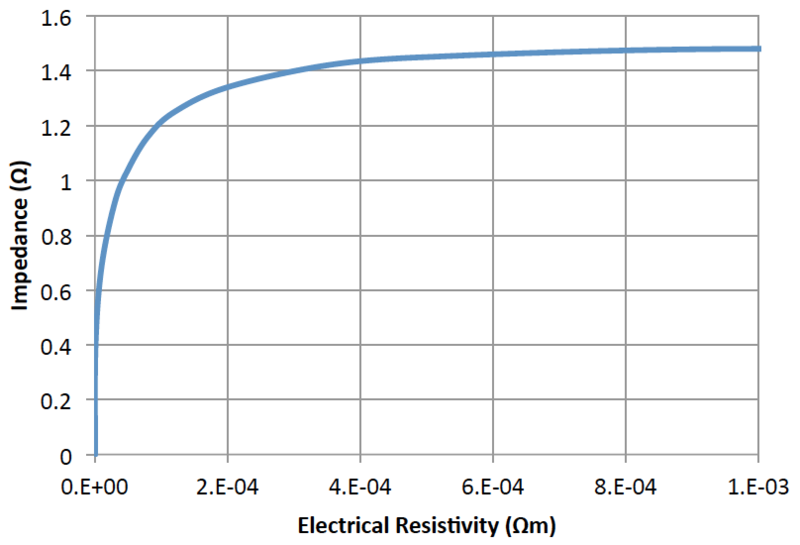 Electrical resistivity can be over 1000x greater perpendicular to the laminates vs in-plane with laminate. Woven structures are pursued in this study due to availability and more favorable properties for induction (generally lower resistivity and more isotropic). 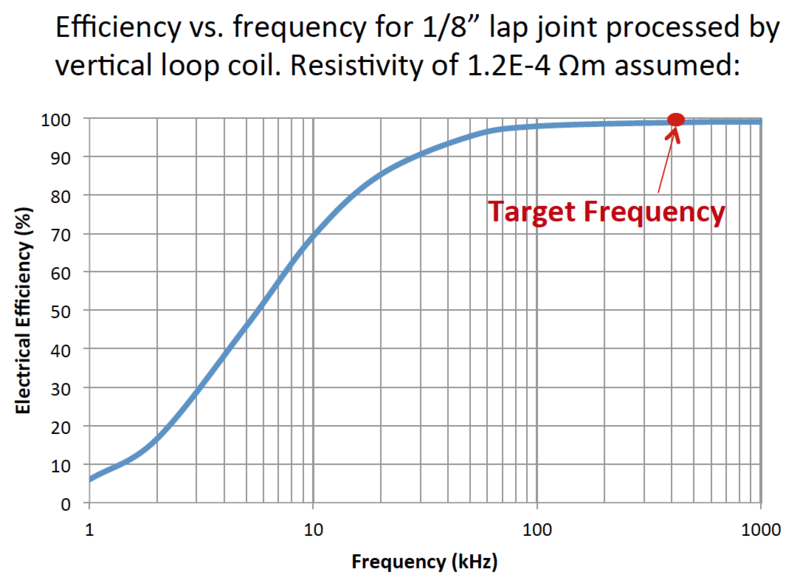 Impedance measured performed with coil only and with CFRT below coil. 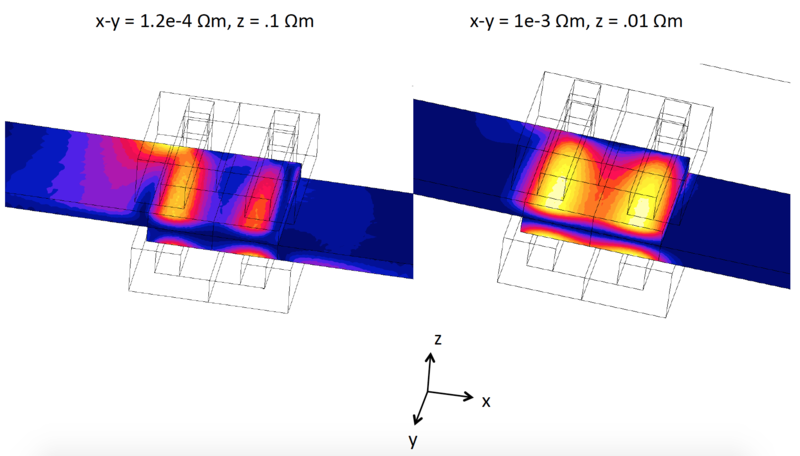 Provides an equivalent resistivity for all directions in-plane. Induced current path illustrated above. 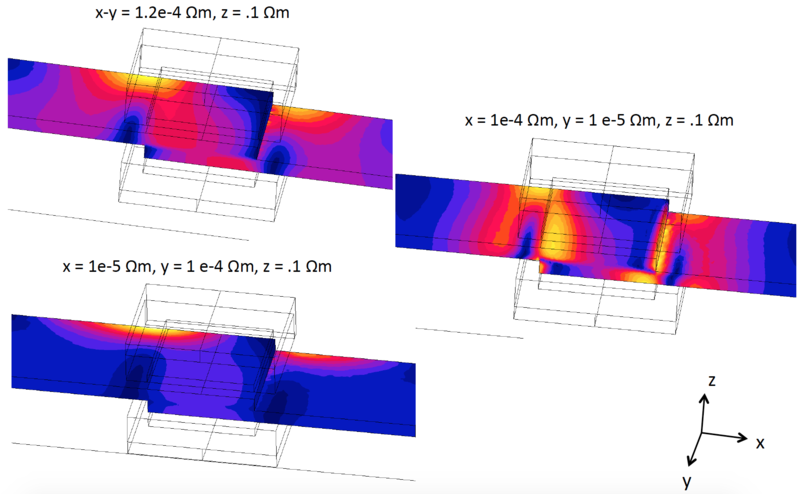 The measurement coil is modeled axisymmetrically in electromagnetic FEA software Flux 2D. The impedance of coil without a load is matched to experiments. 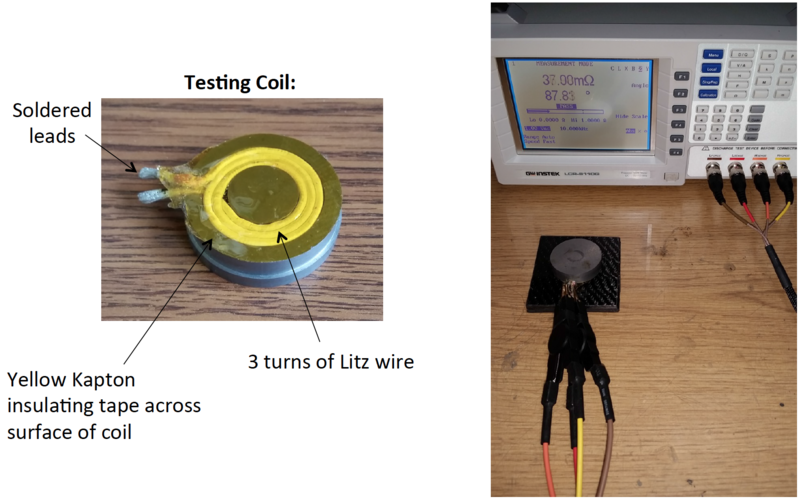 Electrical resistivity is determined by matching the measured impedance with the CFRT load. 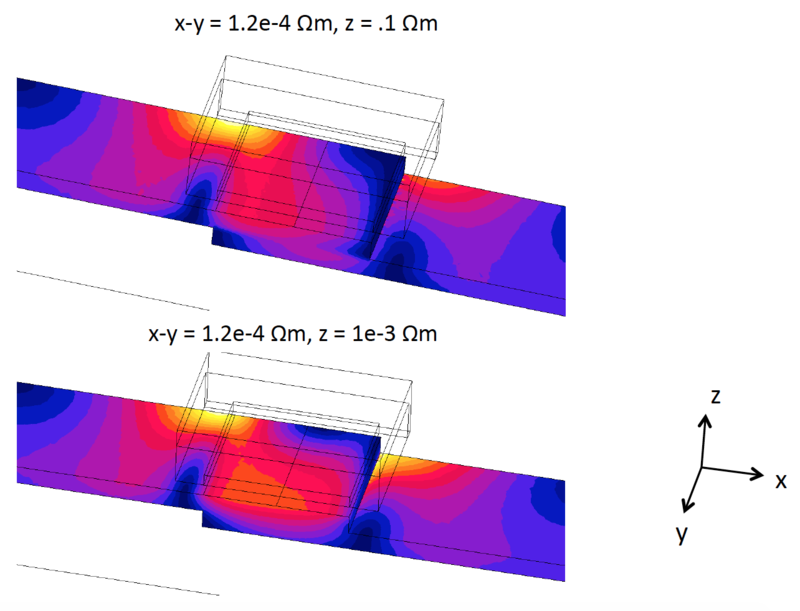 Magnetic field lines and power density in a ½” layer of the material is displayed in the figure on right. 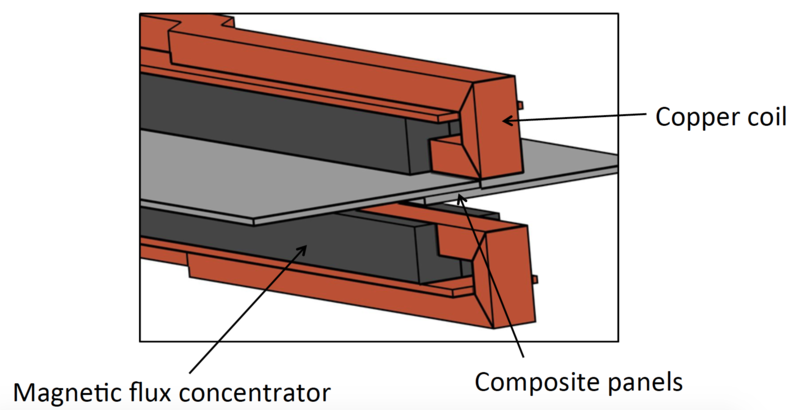 A simple lap joint of two 1/8” CFRT panels is modeled using FEA to represent a welding application. 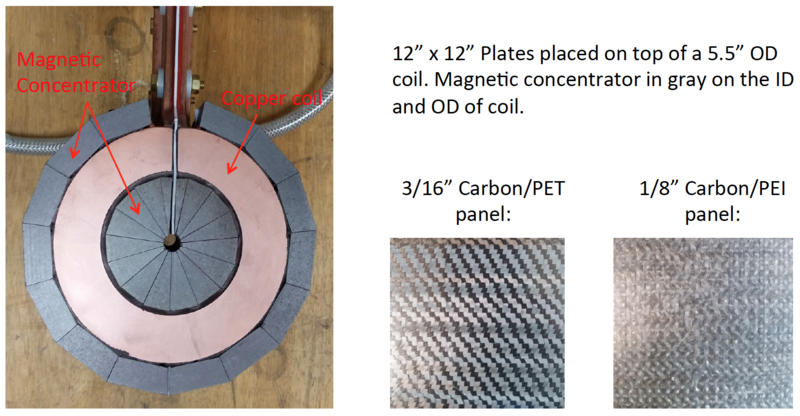 2D and 3D cross-sections are examined with different coil designs. Other surrounding components such as pressure applicators are not considered. 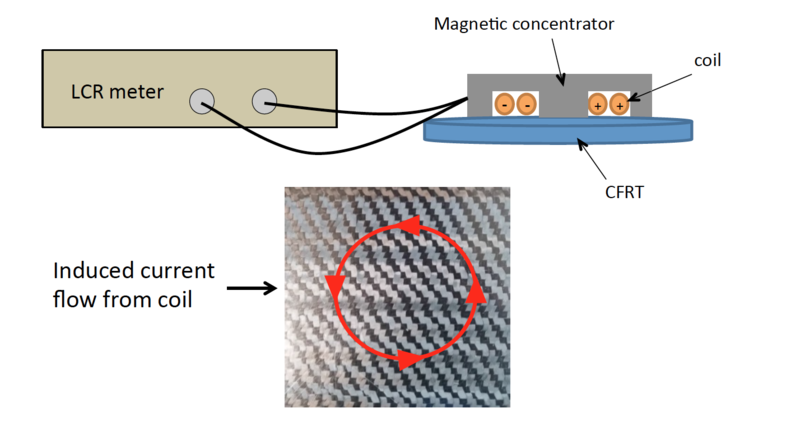 Components between the coil and joint should not be conductive or magnetic, therefore transparent to magnetic field. Components in contact with the joint will affect the thermal distribution. Induction is a contactless method for heating CFRT’s that can be controlled by process parameters and coil design. 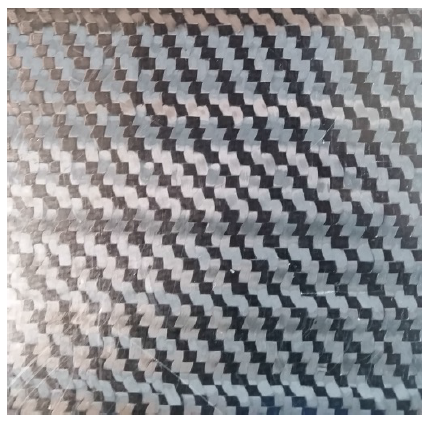 Carbon fiber reinforced thermoplastics (CFRT) can have a large variation in electrical properties depending on the carbon fiber arrangement, matrix material, lay-up schedule, etc. 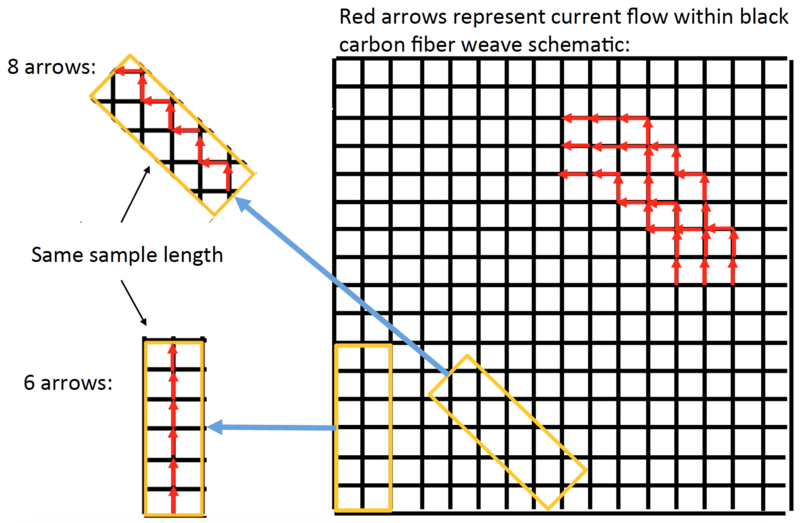 Woven CFRT can be isotropic in one plane or be completely anisotropic. Unidirectional lay-ups will be completely anisotropic for the most part. This makes the thermal performance difficult to predict with the induction method. 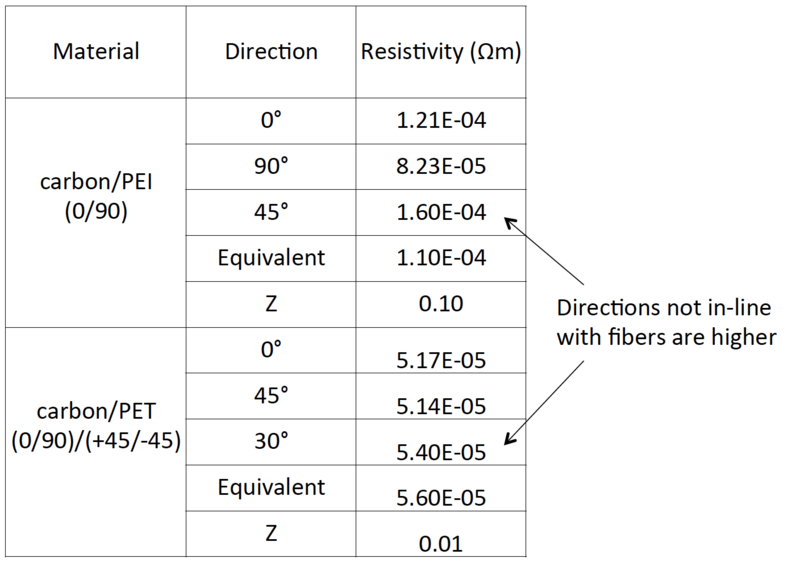 Methods have been described to determine the direction-specific and equivalent electrical resistivity of CFRT. 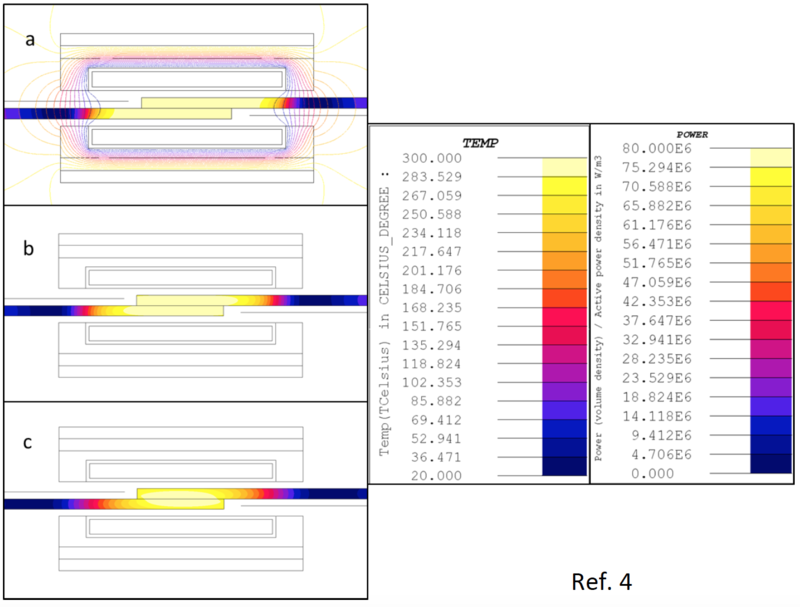 FEA can be used to aid in the prediction of heating CFRT for various coil designs. It is shown that frequencies below the MHz range has effective performance and is easier to utilize with a wide range of coil and equipment design. Components of larger dimensions may show more benefit at even lower frequency.